There are some photos during my last color at https://plus.google.com/photos/112977404858295748931/albums/5889774039907025441, which I believe is public. My hair is naturally dark brown. To get it to take color, I have to bleach it to a lemon color, and that has to be rinsed out. I know plenty of people who do their own bleach, but I’d recommend getting one’s whole head done professionally the first time. I use Pravana Vivid colors (http://pravana.com/products/chromasilk_vivids.html) which are salon colors. The brands that are available vary from country to country, so I’m not sure what’s available where you live. We section the hair into three different areas: a section on my crown in front, which will be colored violet; a section behind that extending from my crown down just a bit lower, which will get colored green on the first 2 or 3cm (about an inch) and blue on the rest; and the third section is the rest of my hair, basically the back and sides, which gets colored green. I use full-strength color, so if there’s any bleeding from section to section it’s not obvious, but one could use foil to separate the sections. This has to process for about half an hour. Then it can be rinsed. As for maintenance, I have relatively dry, non-oily scalp. I mostly just use conditioner to wash my hair. I work it in and massage my scalp with the balls of my fingers, then rinse, then reapply and let that sit for a few minutes while I do everything else I do in a shower, then I rinse it out. Important tip: Whether using shampoo or conditioner, find sulfate-free formulas. The sulfates will tend to strip the color. When re-coloring, only the regrowth (the roots) needs to be bleached. You’ll end up bleaching a bit of the hair that’s been colored, but the thing that damages hair is the bleach, not the color, so avoiding bleaching any part of your hair more than twice is important. I do my bleach and color every six weeks. Initially, it faded quite a bit before the next coloring, but these days there’s so much build up that it doesn’t mostly fade. 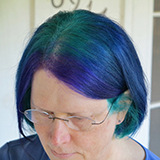 The green in back does fade to a celery color, but that happens fairly quickly. I think it has to do with how I sleep. Thank you so much Kathryn!!! I am totally going to use this in the holidays to get my hair looking as flawless and as fabulous as yours!!! you’re so gorgeouussss, im so jel!! kathryns hair is the best woo! Omg i cant get over how fabulous you are!!!! i love you so much, you are my idol!! your hair is inspiration, you’re so s4ssy!